Who Will Win The Match Today of RR vs CSK 25th Match Indian Premier League 2019? Will Rajasthan take a bold decision before it’s too late? Rajasthan Royals are all set to take on Chennai Super Kings on Thursday, April 11, 2019, at Sawai Mansingh Stadium, Jaipur. If you are looking for Rajasthan Royals vs Chennai Super Kings full squad, the best choice for captain and vice-captain, dream 11 free grand league teams then you are at the right place. We have covered all the above information in details. All the information in this post are accurate and taken from very reliable sources so make sure to read the complete post. If you want to increase your chance of winning by 100% then read each and every section of the post as every section has some important information which can take you to the other side in all fantasy cricket leagues. Chennai Super Kings have played 6 matches, won 5 and lost one match. They are in the first position of the points table with ten points in their pocket. They won their last match against KKR by 7 wickets. Prior to that, they have won against KXIP by 22 runs and lost against MI by 37 runs. MS Dhoni, Suresh Raina, Kedar Jadhav and Shane Watson are the top scorers of Chennai. They have scored 156, 132, 114 and 105 runs. Imran Tahir, Deepak Chahar and Harbhajan Singh are the top wicket-takers. They have taken 9, 8 and 7 wickets. On the other hand, Rajasthan Royals have struggled so far in the 12th season of IPL. They have played 5 games, won one and lost 4 games. They are in the seventh position of the points table with two points in their pocket. They have lost their last match against KKR by eight wickets. Prior to that, they have won against RCB by seven wickets and lost against CSK by eight runs. Jos Buttler, Steven Smith and Ajinkya Rahane are the top scorers of Rajasthan team. They have scored 176, 159 and 124 runs. Shreyas Gopal, Ben Stokes and Jofra Archer are the top wicket-takers. They have taken 8, 4 and 3 wickets. Shane Watson, Faf du Plessis, Suresh Raina, MS Dhoni, Deepak Chahar and Imran Tahir are the key players of Chennai Super Kings Team. The Chennai team management may decide to play with the same team. Deepak Chahar, Scott Kuggeleijn and Imran Tahir will lead the bowling department. Faf du Plessis and Suresh Raina are the most valuable players of the Chennai team. Batsmen: Shane Watson, Faf du Plessis, Ambati Rayudu, Suresh Raina, Kedar Jadhav. Bowlers: Harbhajan Singh, Imran Tahir, Deepak Chahar, Scott Kuggeleijn. MS Dhoni (c & wk), Suresh Raina, Monu Kumar, Shane Watson, Sam Billings, Faf du Plessis, Dhruv Shorey, Ambati Rayudu, Ruturaj Gaikwad, KM Asif, Kedar Jadhav, Karn Sharma, Ravindra Jadeja, Mitchell Santner, Scott Kuggeleijn, Imran Tahir, Deepak Chahar, Dwayne Bravo, Harbhajan Singh, Chaitanya Bishnoi, Murali Vijay, Shardul Thakur, N Jagadeesan, Mohit Sharma. Ajinkya Rahane, Jos Buttler, Steven Smith, Ben Stokes, Jofra Archer and Shreyas Gopal are the key players of Rajasthan Royals Team. Sanju Samson is injured so he will not play. Mahipal Lomror may replace Krishnappa Gowtham in the playing 11. Ajinkya Rahane, Jos Buttler and Steven Smith will lead the batting department. Jofra Archer, Dhawal Kulkarni and Shreyas Gopal will lead the bowling department. Jos Buttler and Steven Smith are the most valuable players of Rajasthan Team. Batsmen: Ajinkya Rahane, Rahul Tripathi, Steven Smith, Prashant Chopra. All-Rounders: Ben Stokes, Krishnappa Gowtham/Mahipal Lomror. Bowlers: Jofra Archer, Shreyas Gopal, Dhawal Kulkarni, Sudhesan Midhun. Ajinkya Rahane(c), Dhawal Kulkarni, Jos Buttler(w), Prashant Chopra, Ashton Turner, Steven Smith, Manan Vohra, Rahul Tripathi, Shashank Singh, Ben Stokes, Shubham Ranjane, Krishnappa Gowtham, Mahipal Lomror, Jofra Archer, Shreyas Gopal, Stuart Binny, Sudhesan Midhun, Liam Livingstone, Sanju Samson, Jaydev Unadkat, Aryaman Birla, Varun Aaron, Riyan Parag, Oshane Thomas, Ish Sodhi. The pitch of Sawai Mansingh Stadium, Jaipur has favoured the spinners and the slow bowlers. It expected that the wicket will behave the same. The Boundaries are big so the batsmen may find it difficult to hit big shots. The weather of Jaipur is predicted to be partly cloudy and it will remain the same throughout the day. There is no sign of rain today. The temperature is expected to be 36-Degree Celsius and the humidity to be 17%. Jos Buttler: 176 runs in 5 matches. Suresh Raina: 132 runs in 6 matches. Steven Smith: 159 runs in 5 matches. Ajinkya Rahane: 124 runs in 5 matches. Shane Watson: 105 runs in 6 matches. Faf du Plessis: 97 runs in 2 games. Ben Stokes: 76 runs and 4 wickets in 5 matches. Ravindra Jadeja: 15 runs and 5 wickets in 6 games. Imran Tahir: 9 wickets in 6 games. Shreyas Gopal: 8 wickets in 5 games. Chennai Super Kings have defeated Rajasthan Royals in Chennai this season. 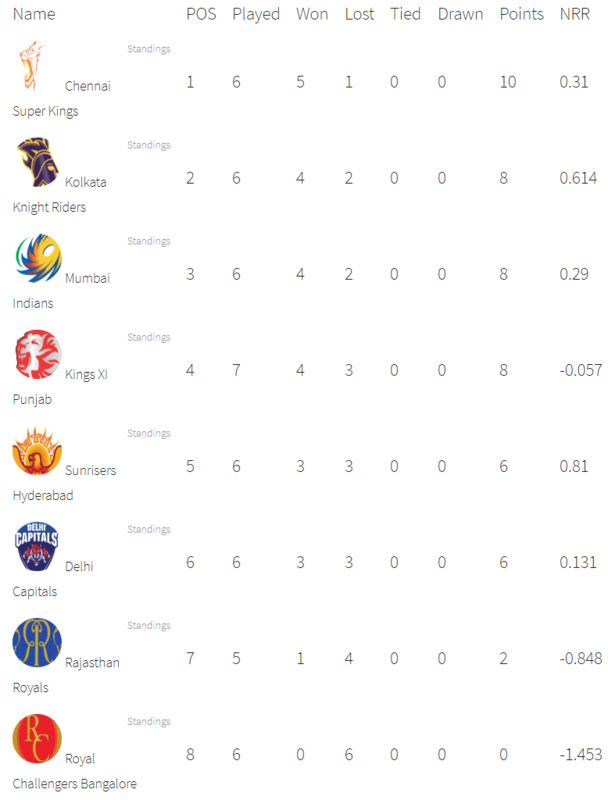 If we look at the statistics of the last five matches, CSK has won three matches and RR has won two games. According to crix11 astrology prediction, CSK will win the match. RR will win the toss and opt to bowl first.